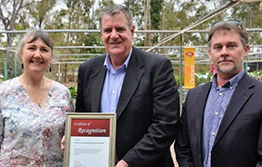 The Queensland Government recently launched BioSecure HACCP (Hazard Analysis and Critical Control Point) at Pohlmans Nursery. NGIA President Karen Brock (L), the Hon. Minister for Agricultural Industry Development and Fisheries, Mark Furner (centre) and NGIA National Biosecurity Manager John McDonald (R) at the launch of BioSecure HACCP. BioSecure HACCP is the first ever approved third-party biosecurity scheme under the Queensland Biosecurity Act 2014. The comprehensive on-farm biosecurity program was developed by Nursery and Garden Industry Australia (NGIA), with Hort Innovation funding, and enables accredited production nurseries to minimise biosecurity risks and self-certify their stock for interstate market access. NGIA President and grower Karen Brock said it was an exciting time for the nursery industry. “BioSecure HACCP evolved from a mere idea into a fully functioning scheme that is empowering biosecurity preparedness and compliance, and enhancing business efficiency,” she said. Ms Brock acknowledged Biosecurity Queensland’s Plant Biosecurity and Product Integrity team for its effort in developing the scheme. Read more about BioSecure HACCP here. Read more about quality assurances in farm management here.